A few hours ago, images of the new Maserati Ghibli were leaked to the web, forcing the Italian company to release images and more information one day earlier than expected. This car is based on a shortened version of the Quattroporte's platform and, like i said earlier, it will include one diesel engine. The teasers are becoming increasingly worse. Maserati created a video teaser to publicize that they will officially reveal the Ghibli on April 10, but you can not call a teaser to a video that shows almost nothing of the car. Still can not wait for the 10th of April! Maserati Ghibli gets teased for the first time! Maserati has just announced they are going to introduce the 2014 Maserati Ghibli at the Shanghai Motor Show, only a few months later after the Italian company unveiled the Quattroporte, which seems a little odd, ending the hype created over the large luxurious four-door saloon. Will the Maserati Ghibli look like this? 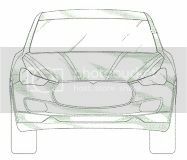 This few images of what appear to be a scale model (see them below) of the Maserati Ghibli (M157) just showed up in another blog. While we cannot confirm the authenticity of the pictures (i mean if they are really from Maserati or if they are from the Ghibli) they actually look a lot like the Ghibli test/development mules. Well at least from we got to see. Like most new cars that were introduced in the last weeks, the 2014 Maserati GranTurismo MC Stradale will also have its premiere at the Geneva Motor Show with an updated engine, a few improved exterior details and one big change inside. Is this the future Maserati Levante? The model previously known as the Kubang had what seems to be two patent drawings leaked on the web. The new Italian SUV will be built at Fiat’s Mirafiori plant (confirmation needed). It will ride on the same platform as the Jeep Grand Cherokee, but according to Sergio Marchionne will be "pure Maserati", whatever that means. Maserati has started to reveal some details about the new Quattroporte and to begin released pictures from every angle imaginable of the car. The car looks more agressive with the major changes happening in the back. Public will have access to the vehicle in the Detroit Motor Show next January.